Zinc coated trolleys with anti-rust treatment. Enquire for branding and any other size requirement.Customers could come in with a long shopping list and wouldn't want to miss out on anything. 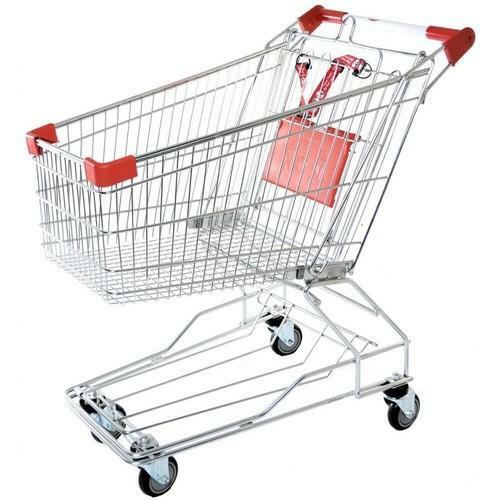 A good shopping trolley can make shopping a pleasent and fruitful experience. Zinc coated trolleys with anti-rust treatment. Enquire for branding and any other size requirement. Customers could come in with a long shopping list and wouldn't want to miss out on anything. A good shopping trolley can make shopping a pleasent and fruitful experience. We are 4th generation members of a family business amazed by the way business is done in Pune’s BohriAli. Our forefathers established our first shop almost 130 years ago and every day here in BohriAli is an experience that makes us richer in our life. As we aim to start off with BohriAli.com, we would like to take the opportunity to thank our customers, the industries that have faith in us, the numerous artists from in and around Pune, some of whom are customers since many generations (Just like us) and invite them to use BohriAli.com for their requirements. Our aim through Bohriali.com is to reach out to the customers that have trusted us over many decades and bring the trusted, seasoned reputed businesses of BohriAli to the e-commerce world in a way that does not compromise any of the principles with which these businesses have been run. We are starting off with providing a painting service called ‘The Paint People’, a few ‘Do it Yourself’ kits and and extensive BohriAli store! Over time, we will increase the amount of products that we are looking to sell, the services we offer, and introduce new innovative DIY projects keeping with the signs of times.